A Man Isolated Himself From Society For Over 25 Years With Only His Dog In The Desert. What He Reveals Inside This Cave Is Incredible! (Sun Gazing) In the high desert of Northern New Mexico, you can hear the sounds of a man entranced in his work underground in a cave. 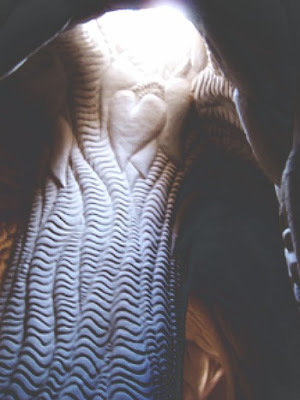 You will see a small entry that opens into a cavern, where Ra Paulette has spent the last 25 years carving New Mexico’s sandstone into magnificent art. He’s spent years doing this work with the company of only his dog. When asked if he is a man obsessed with cave digging, he gives the really thoughtful response: “Is a child obsessed with play?” He waxes on to say, that when you love what you are doing, you are driven to do it all the time. He sees his majestic pieces as environmental projects; his goal is to inspire people such that they open up emotionally, in response to the enormity and power of what his carvings evoke. It can be said that he has created magic in the underground caves that he has carved. They are at once intimate and overwhelming. Interestingly, Ra doesn’t see himself as an artist, but simply as a man expressing his sense of wonder in a passionate way. I would beg to differ with his opinion that he is not an artist. What he has created, is livable art of unbelievable power. The video you are about to watch tells the rest of his story, and gives you a tour of his magnificent caves. Unbelievably, his work had no notoriety until a filmmaker asked to do a documentary about Ra. Called “Cave Digger”, the film ended up winning an academy award! Please share your reactions to this story of peaceful man who’s purpose was a dedication to his craft. I can guarantee that you are about to view something you have never seen before.